Want a faster, easier way to get where you're going? Regional travel on the East Coast just got easier and more convenient with Skyline personal flight service. Picture an option that actually puts you first. Say goodbye to the schedules, lines, and hassles of traditional air travel — Skyline gets you home for the things that matter most. It makes sense to fly to your destination using the option that is always direct and always ready when you are. Do more with your time. Get out of line and straight into your personal air valet today. Anywhere in the Northeast and mid-Atlantic states, Skyline Flight will get you there. With aircraft based in central Massachusetts Skyline Flight operates on your schedule. Whether it’s a quick drop-off at BWI or a trip to New York, New England or the Carolinas, Skyline Flight has you covered! Enter your home or office address to find the airports closest to you. You can enter your full address, a city & state, or a ZIP code. Thanks for requesting your Skyline flight. We will contact you shortly. You safety is our paramount concern – there is nothing that is more important. Our professionalism will be immediately apparent as soon as you walk up to the aircraft you’ve reserved. When you are greeted by your pilot, you’ll be shaking hands with one of the most experienced aviators in the business; our exceptionally trained pilots have thousands of hours of flight time in our Cirrus SR-22 airplanes. The Cirrus aircraft itself is a marvel of exquisite engineering. As a matter of fact, our SR-22 airplanes have more advanced electronics and safety systems than many of the aircraft that make up airline fleets today. Each aircraft is equipped with the latest in global positioning satellite navigation technology, allowing for direct point-to-point flights that will save you time. All flight data is presented on two advanced integrated liquid crystal displays, providing a maximum level of situational awareness to the pilot. Our pilots also benefit from XM satellite weather radar information; this provides early warning of potentially hazardous conditions, ensuring that your flight will be routed around uncomfortable weather at the earliest possible stage of the flight. The Cirrus is a serious all weather machine—even inflight icing conditions that ground other aircraft are no match for its capabilities. Our aircraft are equipped with the TKS weeping wing anti-icing system, which is a proven technology certified by the Federal Aviation Administration (FAA) to keep to the aircraft safe in freezing precipitation conditions. The safety record of the Cirrus SR-22 is second to none. An important component of that great record is that each aircraft is equipped with the Cirrus Airframe Parachute System. In the event of an emergency, a ballistic parachute is deployed that will lower the aircraft safely to the ground. This added safety feature makes the Cirrus SR-22 unique in the world of general aviation. When you fly with Skyline Flight, you aren’t flying with just any company that happens to own some airplanes. We are an FAA certificated air carrier, which means we have met stringent pilot training, maintenance, and government oversight requirements. Safety comes first in everything we do, and we are proud of our outstanding record. Have the freedom to make travel decisions on your terms. Always direct, always on-time, Skyline ensures your personal travel needs are the priority. Let’s face it—airline travel has become inconvenient and unpredictable. Long lines, mega-airport delays, overbooked flights, and time wasting connections have made getting to where you want to be more of a pain than a pleasure. Then there is the drive to and from the airport; the places where you work and play are often not convenient to the airports that the airlines serve. That means that you have to consume even more of your valuable time driving and struggling to find a parking space. The hassles associated with modern air travel have pushed many business and pleasure travelers to the highways and rails, but the problems remain the same: these crowded and slow modes of transportation add up to less productivity and fewer leisure opportunities for you. Here’s an interesting statistic: there are over 5,000 airports with paved runways in the United States. Of these airports, only 537 have airline service. Imagine if you could access any one of those thousands of airports that the airlines have left behind! You would be able to arrive closer to where you want to be than ever before, saving you time and frustration. With Skyline Flight, you can do just that. Our online fare quote tool will help you find the airports that are most convenient for you. Practically any airport with a paved runway will do. You’ll save time and energy by using smaller airports that are close to where you need to be. The days of parking hassles and long lines are over. You simply need to arrive a few minutes before your flight, meet your pilot, and go fly. There are no security screening hassles, no baggage claim, and definitely no overbooking. With Skyline Flight, the days of multi-day business trips around the East Coast are behind you. You will be more productive, more relaxed, and better rested to conduct your business or enjoy your favorite leisure activities. Let Skyline Flight put you back in charge of your most important possession—your time. When you fly with Skyline, you’ll experience a level of personalized service that is unmatched by the airlines, even if you were to buy a first class ticket. When you arrive at the private aircraft terminal at the airport of your choice, you’ll meet your pilot and be whisked directly to your aircraft. There will be no time wasted with checking your baggage or clearing security; you don’t have to do anything other than walk out to your airplane. After a short conversation with your personal pilot that will address any questions or special requests that you have, you’ll be underway. Once you are in the air, you’ll rediscover the joy that flying can bring. You’ll be comfortably seated in your leather seat, enjoying the large windows and panoramic view. You’ll have the option of enjoying your privacy and taking a rest, learning about your airplane and the flight from your experienced pilot, or immersing yourself in your favorite book or game on your device. The ultra-comfortable Bose Quiet Comfort noise canceling headset we provide will give you the peace and quiet that many of us crave. If music is your passion, you’ll find a wide variety of options; you can enjoy the music from your iPhone through the Bose headset, or you can survey the expansive selection of stations available through our onboard XM satellite radio. If you are traveling for business, you’ll have ample opportunity to catch up on work or to review your notes before making a big presentation. Each aircraft is equipped with ample charging ports, so keeping your devices charged and ready is never a problem. By the time you arrive at your destination, you’ll be relaxed and ready for the tasks that lie ahead. Skyline Flight prides itself on personalized service—that’s what sets us apart from the crowd. Your pilot will be happy to answer any questions you have or address any concerns. And remember this: we exist to make your life easier. We are always prepared to accommodate last minute flight requests. Just give us a call at (877) FLY-SKYHI or (877)359-7594. My wife and I have flown with Skyline repeatedly over the past year or two. 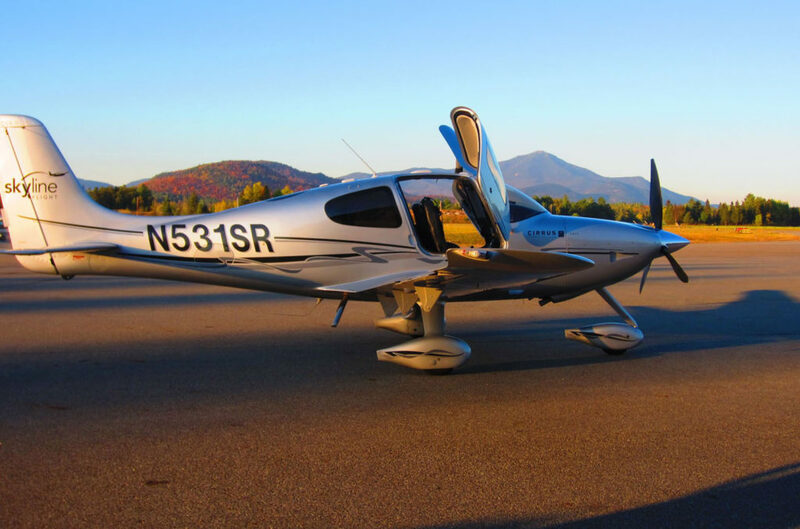 The Cirrus is a great way for us to get around the Northeast, whether on business or to see family that is just slightly outside easy driving distance. The planes are modern and comfortable and Skyline has never disappointed, accommodating last minute travel requests very flexibly. Recently my husband and I had the pleasure of flying to Bar Harbor with Skyline. Not only did it save us many hours of driving but the trip was smooth, comfortable and first class. We spent our time being at our destination rather than driving to it. The convenience can’t be beat and the pilots were exceptionally attentive. Can’t wait for the next flight! A recent trip involved picking up three people, all at different locations. The three travelers were picked up in NH, MA and CT, dropped off for a meeting in NYC, and then returned to their original locations. Skyline got us where we needed to be on time and without a hitch. They keep abreast of current weather conditions and stay in touch with their passengers to keep them up to date on any changes that might be necessary. The pilots are very personable and professional and have continually provided a comfortable flying experience. Skyline was able to get me to my meeting in Northern Vermont on time with no advance notice! I was back in my office in Central Massachusetts that afternoon — 2 hours ahead of my anticipated return. This allowed me to attend another meeting that I would've normally missed. The time savings alone was well worth the trip. With their new aircraft, it was a very comfortable, professional, and pleasurable flight. I travel extensively in my professional affairs. On a recent vacation to Block Island, I used Skyline to avoid extensive ground transportation after a cross-country flight. I was very pleased with the professionalism of the company. A week later ... weather interceded and grounded flights from Block Island. With support and coordination by Skyline that included ferry, ground transport and an immediately altered flight plan, I boarded the last flight to the west coast from Newark. The customer service was exemplary against any standard. I cannot say enough about the staff and pilots at Skyline; their performance was extraordinary and I look forward to the next opportunity to fly with their team. You live in Northborough, Massachusetts and you and your partner have a sales presentation with a new client in Burlington, Vermont at 10:30 on Tuesday morning. The average person would need to wake up at 4:15 a.m., get in their car at 5 a.m., and drive 4.5 hours only to arrive tired and worn out for the presentation. After the meeting, they would drive home and arrive 4.5 hours later, completely exhausted. Skyline Flight has redefined this trip. Now you can get up at a reasonable hour and have breakfast with the kids. After sending them off on the bus, you drive 20 minutes to Fitchburg, Mass. for a 9 a.m. flight. After just one hour in the air, time used to polish up that presentation, you arrive at Burlington at 10 a.m. where your rental car is waiting. You close the deal in one hour and have the signed contract in your brief case! Now it’s 12 noon and you know your buddies are teeing off at 2 p.m. in Stow . . . No problem. Skyline will have you back to Fitchburg by 1:15, so you can make your tee time. And to top it off, you’re home by 7 p.m. for dinner with the family. The extraordinary person would say, “Great, I’ll call Skyline Flight! They’ll meet me at the Worcester Airport at 4:45.” One call to your personal airliner and you’re on your way to the game — we’ll even arrange to have a Town Car waiting in New York to bring you to the stadium, complete with refreshments. After the game, you’ll be flown back to Worcester and home in your own bed — no hotels, no driving, no traffic, no hassles! Of course, at Skyline Flight you have the option to take along a second or even a third passenger for the same fare, your choice! We enjoy talking about Skyline and all it has to offer. If you have questions, we encourage you to call us to learn more about how we can make your travel experience more efficient and enjoyable. FAA Certificate 6SKA660M | Copyright 2017 © Skyline Flight | Created by MeToo! Studios.